MASV.io, the pay-as-you-go large file acceleration tool has announced a major product expansion. I reviewed MASV.io back in early 2017 and I found it to be a very fast, easy to use way of sending my clients large files. If you aren’t familiar with MASV.io it’s an accelerated file transfer service that enables anyone to send enormous files (typically 20GB and higher, far beyond the limits of other popular cloud sharing services) over an accelerated cloud network, entirely within the browser. 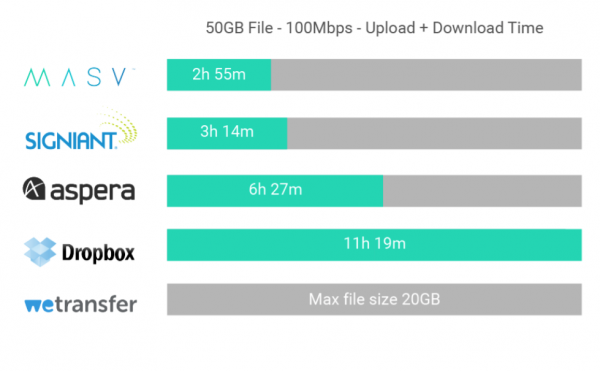 MASV.io uses a pay-as-you-go pricing model of $0.15 per GB. I like the idea of pay-as-you-go, as you aren’t locked into any contracts or subscription fees, and it means that you only pay for the service when you need it. The interface also tells you exactly how much the cost is going to be before you start sending. As an example, if you send a 60GB file it is going to cost you $9 US. If you take into account how much it is to purchase a hard drive and the associated courier costs, you can see how a service like this makes a lot of sense. The browser-only HTML5 application requires no software installation, instead, allocates bandwidth to users based on the speed of their internet connection to guarantee file transfer results that are as fast and predictable as any UDP-based solution. With no file size limitations or transfer speed caps, MASV Rush can transfer even the largest RAW video files or file sets quickly and securely. This latest product update delivers three key improvements that significantly widen the service’s appeal among video professionals. The three big new features are MASV Teams, MASV Branded Transfers, and Password Protected Transfers. MASV Teams brings the same speed, flexibility, and data scalability individual MASV users have come to rely on while introducing powerful multi-user capabilities well suited to teams of postproduction professionals, corporate brands, and broadcasters. MASV Branded Transfers introduces a completely customizable upload and download experience, allowing users to create branded pages and emails for clients and partners. Password Protected Transfers, a feature requested from MASV users, introduces a new level of security to MASV. You can now password protect your transfers so that only the correct people have access to opening the download links and files. You can now require passwords for your recipients to fill out before accessing your deliveries. Simply set a password during upload and tell or text your recipients the password to gain access. MASV.io has seen a 10x growth in network traffic since the adoption of a Microsoft Azure cloud backbone that they introduced back in Q4 2017. For a full list of new features and a free 400GB trial, you can visit www.masv.io.